White wines from the Portuguese Vinho Verde region are some of my favorites, so I jumped at the chance to try a quartet of them last month in San Francisco. Obligatory disclaimer: The food and Vinho Verde wines I’m about to write about were provided for free to me from Benson Marketing, which represents the Wines of Vinho Verde and Wines of Portugal organizations. The wines were just as different in style as the grapes in their blends, though they offer exceptional value across the board. Back in the late 2000s, when I thought all white wines were heavily oaked and heavily unappealing to me, Vinho Verde wines were a revelation. I loved their fresh acidity then and still do now. They are usually meant to be enjoyed young and offer delicious grassiness and subtle effervescence. Vinho Verde wines are fun and playful, not straight-laced and serious. But they also, for decades, have been made as blends featuring interchangeable grapes — any of 45 specific varieties are allowable per current rules. This evening was a chance to taste Vinho Verde wine made with more focus on individual varieties, an increasing trend in the region. –and dishes with just enough spice to evoke a smile, Hawker Fare’s fare was an ideal companion for these wines. Their green papaya and shrimp salad melded well with the seltzer-like finish of the Quintas de Melgaço Torre de Menagem 2015 Alvarinho/Trajadura blend. Using only alvarinho and trajadura grapes, this wine mimicked qualities of chardonnay and Champagne while still being uniquely itself. Light oak notes may please the chardonnay fans, and breadiness assuages the bubbly lovers, but that graham cracker crumble followed by green grape is its own unique draw, as is the seltzer finish. I gave it a 3/5 — with a little more balance, this wine would improve a point. It’s available for $10-$13 in online stores. And it was one of the two youngest wines we tried that evening. The other, the Quintas das Arcas Conde Villar Branco 2015, delighted me with citrus and warmth unusual for a white wine, especially from Vinho Verde. I’d liken it to a ramekin of warm key lime custard with a great kick of bubbles, more than is customary for Vinho Verde. 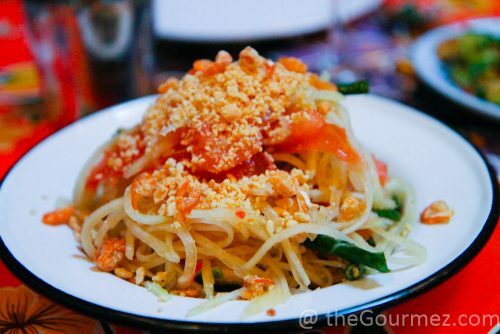 The Branco 2015 would go well with mild spice to be found in dishes like Vietnamese rice noodles. 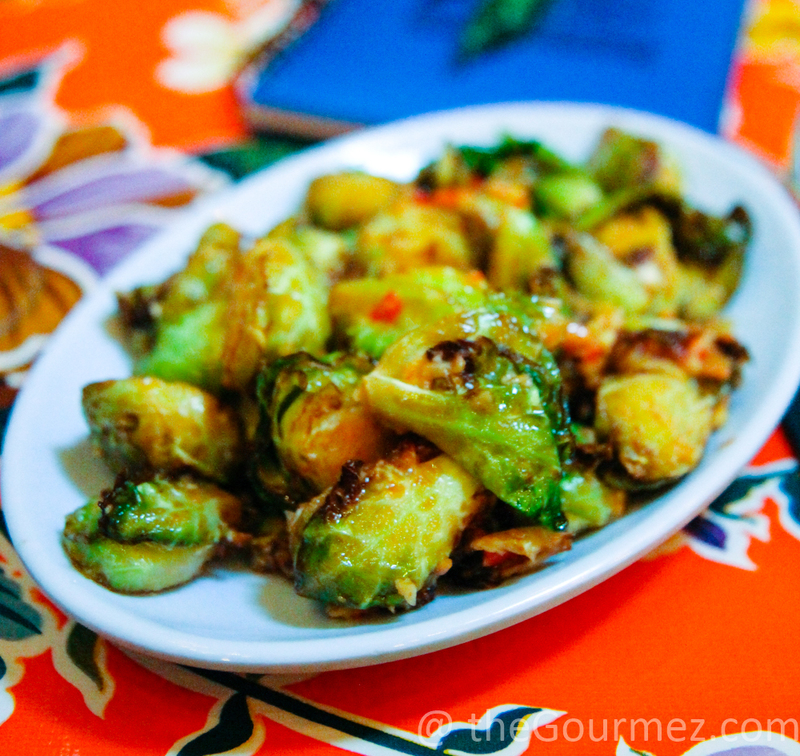 We did not have a noodle dish at Hawker Fare, but all the wines found a friend in the brussels sprouts tossed in dry pad prik king curry spices. Mmm. Folks, those are good brussels sprouts. You can taste butter on every separated layer of cabbage without feeling weighed down by it. The garlic was especially nice, and with the help of the wine’s bubbles, it didn’t linger long. 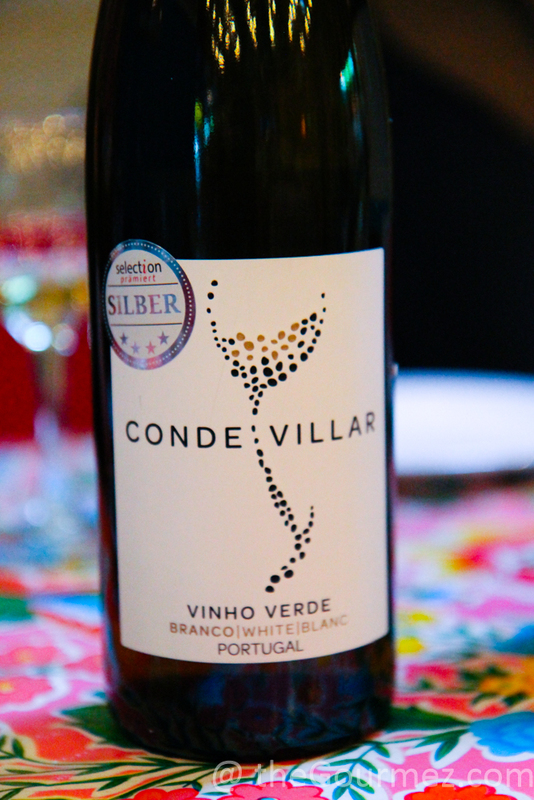 Those bubbles were especially memorable, contributing to the Conde Villar Branco’s 3.5/5. It’s available for $10 online. Yes, only $10! A blend of loureiro, arinto, and trajadura grapes, it was a lot of fun to compare and contrast with the Torre de Menagem. Both wines offered very different fruit notes, levels of effervescence, and takes on what makes a young wine appealing. 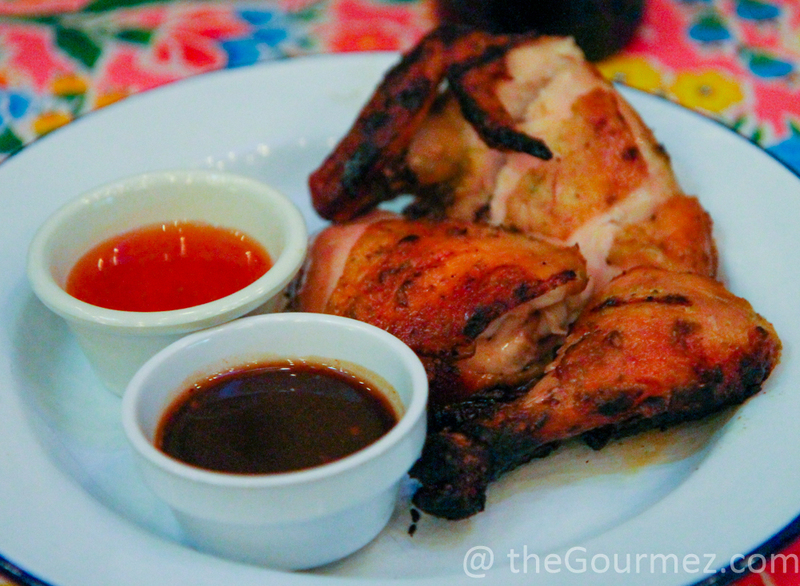 With the Quinta de Gomariz Avesso 2014, we moved out a year in vintage and shifted to the avesso grape varietal, yielding a wine with lots of bubbles that I found most intriguing for its herbal notes and most complementary with Hawker Fare’s dishes. 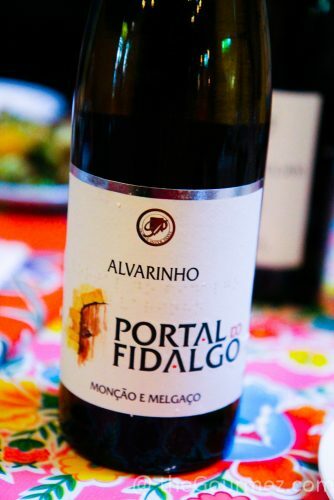 “Chase after the minerals peeking out from behind the bubbles in this extra fizzy vinho verde. Tastes of syrupy pineapple juice from a can with hints of lychee, a healthy nutmeg grate, and a dash of annatto’s sweet heat,” reads my Vivino review. At 3.5/5, it’s a steal at the lowest purchase price I found ($7) and still worth it at the highest ($24). The QG Avesso livened up a delicately marinated, and somewhat dry, barbecue chicken dish served with prik pao chile paste. 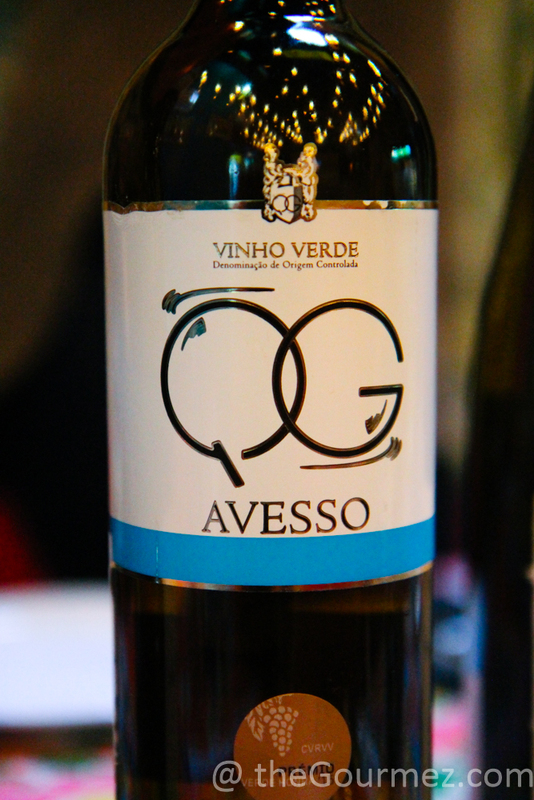 While I had noticed the 2014 Avesso was more complex than the younger Vinho Verde wines we’d tried, it was the final wine that drove home the potential of aging these offerings—not that four years is long aging, but the difference was plain. 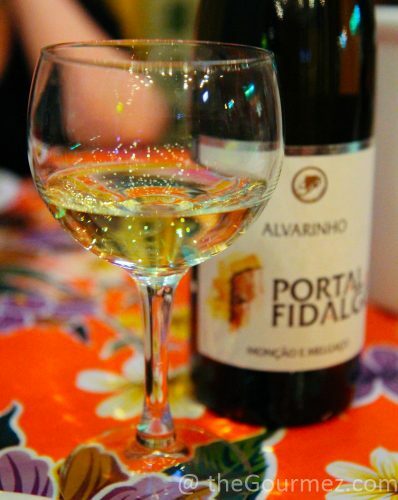 The 2013 Portal do Fidalgo Alvarinho appealed to me with oak that complements mild spice in the glass — faint turmeric, in particular. Grapefruit and white flower notes open up as you drink on. At $15 a glass, it’s the most expensive of the wines we tried that night, but at 4/5 stars, still a great value. 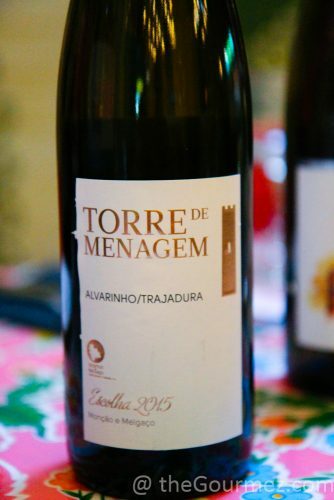 This 100% alvarinho wine couldn’t be more different from the Torre de Menagem alvarinho/trajadura blend, offering a better balance but also more body — whether that’s what you want from a Vinho Verde depends on the evening. 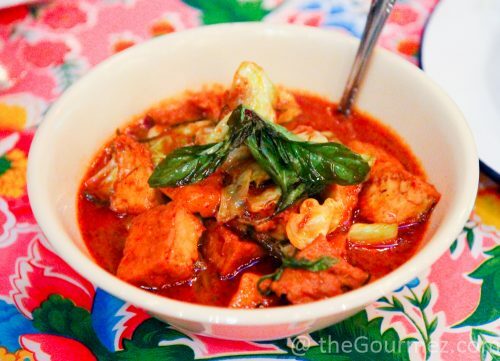 Paired with a Penang tofu curry that had excellent flavor from a crisp cabbage sauté, pumpkin, and perfectly fried tofu, it made for a great finishing round for our Happy Hour. 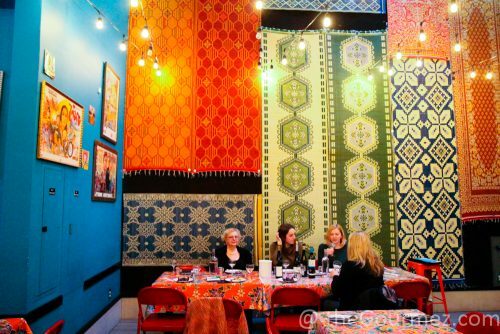 I greatly enjoyed the variety to be found among these varietal concentrations out of Vinho Verde and getting to see them strut their stuff in combination with the delightfully restrained heat of Hawker Fare’s dishes. My high opinion of Vinho Verde’s white wine merits remains unchanged, but I’m perhaps more excited than before for the value they offer in the pursuit of playful wines.